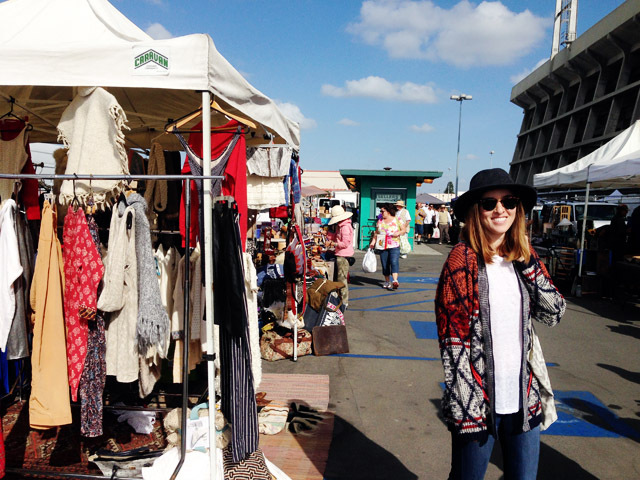 Over the weekend, I went to the Long Beach Antique Market with Jaymee and talk about a total brain explosion (enter my favorite GIF here). We both majorly scored and barely spent any coin (I spent $60 for everything in the pic above) – what more could you ask for in a flea excursion? I think it was Jaymee’s good thrifting vibes that helped. THAT and the fact that we’re both bad influences on one another and say YES BUY THAT whenever we spot something fantastic. She practically made me regret my whole existence if I didn’t buy that basket (and even haggled it down a couple bucks for me). It might have been a combination of being so used to the overpriced Rose Bowl flea (and going in haggling wars with Natalie Portman, I’ve seen it happen), the $80 kilim pillow prices on Etsy (mine above was $18), and walking through my favorite Heath Ceramics one too many times and starting to think $38/mug was normal (give me everything from there, though), that made the Long Beach flea such a breath of fresh air and quite frankly, a shock to my system. I mean BLOW MY MIND WHY DON’T YOU. Also, this uo sweater. Wearing her everyday. ONE / i FINALLY took kyle out for his birthday dinner (i say “finally” because his birthday is september 10th and you’d think i could take him out sooner because we live together but sometimes i fail as a girlfriend, don’t we all?). so we went to picca in LA and trust me when i say this: our minds were BLOWN. we’ve been to picca’s sister restaurant in dtla before (called mo chica), but i’m pretty sure japanese-inspired peruvian food is my new jam. did you watch New Girl last night? the whole episode was about picca and we got a hearty chuckle out of it. also, avocado cocktails. i mean, whattttt???? TWO / i go on a lot of business lunches and i love when people suggest fun places to meet, like hotel bel air. it’s tucked in the hills above sunset blvd and for 2 hours of my day (lunches aren’t something to mess around with), i feel like i’m on vacation. don’t even get me started on the lush greenery and beautiful grounds. it’s fancy as F so i usually feel a little out of place, but like i said in my last post, we all deserve a little fanciness once in awhile. THREE & FOUR / i skipped work on monday to attend a super fun photography workshop with my girls, Jaymee and Ann-Marie. you can see more from our day on ann-marie’s blog, but we always have so much fun together. after the class, we had lunch at eat drink americano in the arts district and that chalkboard wall? whoever did that, you’re hired. Spontaneous adventures on the weekends are my bread and butter. Give me a full day of excitement and I’ll be good to go, bonus points if it’s totally random and unplanned. I just need some sort of activity on the weekend, whether it be going out to a simple brunch/lunch or a day trip to somewhere outside of LA. Poor Kyle, he just wants to work, study, and watch soccer games all weekend and I force him to take me out. SORRY I’M NOT SORRY. During the week though? Please let me stay home and do nothing all day long, which of course I can’t do because of work. Such is life? On Saturday morning, Kyle asked if I wanted to brunch with his family at Paradise Cove in Malibu and duhhh yeah. Brunch on the beach? YES. That’s exactly the kind of spontaneous weekend adventure I need. After brunch, we walked around the private coves, stayed clear of the freezing water, and soaked up that summer sun. My favorite. By the look on my face, one would assume that I despise working out. One would be correct in that assumption. But I will say this: I do enjoy a good hike when all is said and done. You might be shocked by this but LA has some of the best hiking around. On the weekends, we like to try different trails and I undoubtedly complain about the dirt and I trip over a few rocks here and there, oh but the beauty around me! This day was particularly foggy but on a clear day, you can see from downtown to the ocean and vice versa. So if I’m going to work out, which is a rarity in itself, it’ll be on the trails, hiking the hills around this city of mine. All I need is a puppy. SOMEBODY GIVE THIS GIRL A PUPPY.